BuzzFeed’s Chief Commerce Officer Ben Kaufman and his 65-person team generated $50 million in revenue this year by successfully combining commerce and advertising, according to Bloomberg. BuzzFeed CEO Jonah Peretti told Bloomberg the company is on track to grow revenue by a double-digit percentage, and commerce is a large part of that growth. That’s good news for a company that laid off 100 people last fall, restructured its advertising sales organization “amid a tough digital media market” and shut down its podcast team in September. BuzzFeed reportedly fell short of its $350 million revenue target last year. Ecommerce revenue for publishers tends to come primarily from affiliate links. BuzzFeed, known for its listicles, will publish posts like “20 Items You Need To Throw An Unforgettable Thanksgiving,” with links that send readers to purchase through retailers such as Amazon and Walmart for dinnerware and potato peelers. Publishers get a cut of the sales when consumers purchase through a link on their site. 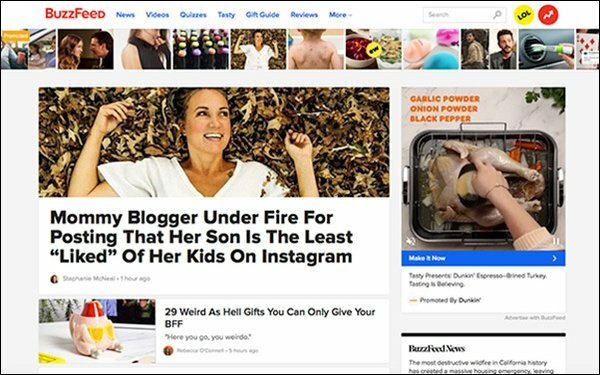 BuzzFeed launched a dedicated product review site in August to recommend products to readers and expand its affiliate business. BuzzFeed also licenses its Tasty and Goodful brands for home and kitchen products, sold at Walmart and Macy’s. But BuzzFeed is also taking its relationship with commerce deeper. It is collaborating with clients to develop products for the audience it knows well: young people and millennials. Brands pay BuzzFeed to develop a product for that demographic, then spends money advertising on BuzzFeed’s platforms. BuzzFeed may also get a cut of the sales. BuzzFeed’s product team has created everything from “Fundle,” a bundle of beach products for Maybelline, to “Lunarly,” a plant and wellness product subscription box for Scotts Miracle-Gro Co., per Bloomberg.